The ideal gas equation PV=nRT, ideal gas theory, how to determine the relative molecular mass Mr of a volatile liquid, Dalton's Law of partial pressures, ideal gas behaviour and non–ideal gas behaviour, Graham's Law of diffusion, Van der Waals equation of state, compressibility factors, critical pressure, critical temperature. This page is well above GCSE level but useful for A Level chemistry or A Level physics. A most 'compact molar' form of all the P–V–T equations is known as the ideal gas equation and is the simplest possible example of an 'equation of state' for gases (see also Van der Waals equation in section 5b). The explanation of the use of the word 'ideal' is explained in the 4. Introduction. The equation is pV = nRT and requires a consistent set of units, so see below for the two most common examples, and take care! The first set are becoming the 'norm' since they are the SI units, but the mass does not have to be in kg and can be in the more 'practical unit' of g as long as Mr is in g mol–1. (a) Describe with the aid of a diagram a simple gas syringe method for determining the molecular mass of a volatile liquid. A 100 cm3 gas syringe is mounted in an oven (ideally thermostated) but a humble bulb will do and the temperature is quite stable after an initial warming up period via internal convection. Some of the liquid (whose Mr is toe determined), is sucked into a fine 'hypodermic' syringe (e.g. 0.2cm3) and the syringe weighed. Quickly (to avoid evaporation losses), the liquid is injected into the gas syringe via a self–sealing rubber septum cap and the syringe re–weighed immediately. The difference in weighings gives the mass of liquid injected. When the gas volume has settled to its maximum value the volume is read (to the nearest 0.5cm3 if possible), together with the oven temperature and barometric pressure (mercury barometer for best accuracy i.e. in mmHg). (b) In an experiment using the above apparatus the following data were recorded and the molecular mass of the volatile liquid calculated. When volatilised the liquid gave 67.3 cm3 of gas. The temperature of the oven = 81oC, barometric pressure 752 mmHg. Using the equation PV = nRT, calculate the molecular mass of the liquid. (c) If the compound was formed from the reaction of bromine and a hydrocarbon, suggest a possible molecular formula for the compound. (d) State very briefly, a method of determining the molecular mass of ANY compound that can be vapourised intact. Mass spectrometer, from the molecular ion peak. (a) What is the volume of 6g of chlorine at 27oC and 101kPa (approx. 1 atm)? and p = 101 x 1000 = 101000 Pa.
(b) What is the volume of the chlorine in dm3 and cm3? (a) A 5 litre container contained 0.5kg of butane gas (C4H10). Assuming ideal gas behaviour calculate the pressure of the gas if the cylinder is stored at 25oC. For other gas calculations see Mole definition and Avogadro Constant, molar gas volume and reacting gas volume ratios. Dalton's Law of partial pressures states that at constant temperature the total pressure exerted by a mixture of gases in a definite volume is equal to the sum of the individual pressures which each gas would exert if it alone occupied the same total volume. For a mixture of gases 1, 2, 3 ... ptot = p1 + p2 + p3 ... where p1, p2 etc. represent the partial pressures. 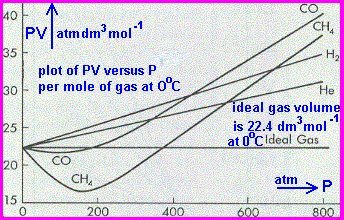 The partial pressure ratio is the same as the % by volume ratio and the same as the mole ratio of gases in the mixture. In the manufacture of ammonia a mixture of nitrogen : hydrogen in a 1 : 3 ratio is passed over an iron/iron oxide catalyst at high temperature and high pressure. What are the partial pressures of nitrogen and hydrogen if the total pressure of the gases is 200 atm prior to reaction? Methanol can be synthesised by combining carbon monoxide and hydrogen in a 1 : 2 ratio. In an experimental reactor experiment, 300oC at a total pressure of 400kPa, the final equilibrium gaseous mixture contained 10% carbon monoxide. (a) Calculate the % of hydrogen gas and % methanol vapour in the final mixture. Whatever hydrogen is left, its % must be double that of carbon monoxide since they were both mixed and react in a 1 : 2 ratio, so there will 20% hydrogen in the equilibrium mixture. Therefore there will be 100 – 10 – 20 = 70% methanol in the final mixture. (b) Calculate the partial pressures of the three gases in the mixture. (c) Calculate the value of the equilibrium constant, Kp, under these reaction conditions (use Pa pressure units). Note that although the equilibrium constant seems small for the 70% methanol, its to do with the relatively large numbers on the bottom line and a power of 2 as well. Diffusion, or the 'self–spreading' of molecules, naturally arises out of their constant chaotic movement of particles in all directions, though on a time average basis, more molecules will move in the direction of a region of lower concentration down a diffusion gradient if such a situation exists e.g. initially 'pouring bromine vapour into air' in gas jars (see GCSE notes). Molecules of differing molecular mass diffuse at different rates. The smaller the molecular mass, the greater the average speed of the molecules at constant temperature. The greater the average speed of the particles the greater their rate of diffusion. See notes on the Maxwell–Boltzmann distribution of molecular velocities. This conceptually explains Graham's Law of diffusion, explained below. It has been shown that, assuming ideal gas behaviour and constant temperature, the relative rate of diffusion of a gas through porous materials or a mixture of gases or a tiny hole (effusion) is inversely proportional to the square root of its density. Since the density of an ideal gas is proportional to its molecular mass, the relative rate of diffusion of a gas is also inversely proportional to the square root of its molecular mass*. * PV = nRT, PV = m/MrRT, Mr = mRT/PV, since d = m/V, then Mr is proportional to density. Which is the mathematical ratio representation of Graham's law of diffusion for comparing two gases of different molecular masses. Graham's Law arises from the fact that the average kinetic energy** of gas particles is a constant for all gases at the same temperature. **The formula for kinetic energy is KE = 1/2mu2, where m = mass of particle, u = velocity. This means the average mu2 is a constant for constant kinetic energy, so u is proportional to 1/√m and the m can be shown via the Avogadro Constant to be proportional to Mr, the molecular mass of the gas. You have to think of the molecules 'hitting' the space of the pore or tiny hole and passing through the. The greater the speed the more chance the particle has of passing through this 'porous space'. Two cotton wool plugs are separately soaked in concentrated aqueous ammonia and hydrochloric acid solutions respectively and sealed in a long tube with rubber bungs. Using a simple chemical equation and Graham's Law of diffusion, account for (a) the appearance of a 'white smoke ring' and (b) the fact the smoke ring occurs about 2/3rds along from the ammonia end of the tube. (a) The aqueous ammonia will give off ammonia fumes and the conc. hydrochloric acid gives off hydrogen chloride fumes which will diffuse down the tube towards each other. When the meet an acid base reaction gives fine crystals of the salt ammonium chloride. and this shows that ammonia will diffuse about 50% faster than hydrogen chloride so the smoke ring will appear much nearer the HCl end of the tube. Zeolites are silicate minerals that are porous at the molecular level and they are used as catalysts and 'molecular sieves' in the petrochemical industry in processes such as cracking and subsequent molecule separation. (a) Calculate the relative rates of diffusion of pentane CH3CH2CH2CH2CH3, hexane CH3CH2CH2CH2CH2CH3 and 2–methylpentane (CH3)2CH2CH2CH2CH3 into a zeolite mineral. Hexane and 2–methylpentane are structural isomers of C6H14 with the same molecular mass. (b) In practice 2–methylpentane does not diffuse into the zeolite as fast as hexane or maybe not at all. Suggest a reason for this behaviour. The 'methyl branching' in 2–methylpentane makes it a more bulky molecule that has greater difficulty fitting into zeolite minerals. (a) Calculate the relative rates of diffusion of the hexafluorides of the two uranium isotopes. (b) Suggest why the process must be repeated many times before enough enrichment has occurred. For each diffusion 'run' only a very small enrichment occurs because of the similarity of the molecular masses of 235UF6 and 238UF6 and hence the very similar rates of diffusion. Certain postulates in the kinetic theory of gases (see section 4.) are far from true in real gases, particularly at higher pressures and at lower temperatures. This can be clearly seen in the diagram on the right. If the gases conformed to the ideal gas law equation PV=nRT, the product PV should be constant with increasing pressure at constant temperature, clearly this is not the case. It can also be seen that the greatest deviation from ideal behaviour always tend to occur at higher pressures (right diagram) and often at lower temperatures (see the compressibility factor diagram in 5c) and both positive and negative deviation occur. Several points in the theoretical kinetic particle model cannot be ignored in 'real gases'. The actual volume of the molecules (Vmolecules) is significant at high pressures i.e. the free space for random particle movement (Videal) is less than it appears from volume measurements. At very high pressures therefore, the value of PV becomes greater than the ideal value and presumably outweighs the intermolecular force of attraction factor which would tend to increase the closer the molecules are and decrease P (see forces arguments next). The deviation from ideal gas behaviour due to the molecular volume factor will generally increase with (i) the greater the pressure and (ii) the larger the volume of the molecule (~increasing Mr). Intermolecular forces always exist i.e. instantaneous dipole – induced dipole forces (Van der Waals forces) between ANY molecules and at high pressures the molecules are closer together and so attraction is more likely to occur. As a particle hits the container side there is an imbalance of the intermolecular forces which act in all directions in the bulk of the gas. Just as the particle is about to hit the surface there will be a net greater attraction towards the bulk of the gas as the molecule, so reducing its impact force i.e. reduces its 'ideal' pressure (pideal) by an amount (preduction). At lower temperatures when the KE of the molecules are at their lower values, the intermolecular forces can have more of an effect in reducing P, so the PV value is less than the ideal value. The effect becomes less as the temperature increases (see graph in 5c.) and also as the pressure becomes much higher when the molecule volume factor outweighs the intermolecular force factor. These intermolecular forces will increase the bigger the molecule (~increasing number of electrons) and the more polar the molecule where permanent dipole – permanent dipole forces can operate in addition to the instantaneous dipole – induced dipole forces. Also, the lower the temperature, the kinetic energies are lower so its more likely that neighbouring molecules can affect each other. The reduction in pideal also increases with increasing pressure too, since the molecules will be on average closer together. There is direct experimental evidence for the effects of intermolecular forces in gases from adiabatic expansion or compression situations. Adiabatic means to effect a change in a system fast enough to avoid heat transfer to or from the surroundings. e.g. (i) If a gas at high pressure is suddenly released through a small nozzle it rapidly cools on expansion into the lower pressure zone. The reason for the cooling is that in order to expand the intermolecular forces must be overcome by energy absorption, an endothermic process. The change is so rapid that the source of heat energy can only come from the kinetic energy of the gas molecules themselves, so the gas rapidly cools. This is observed when a carbon dioxide fire extinguisher is used, just for a second bits of solid CO2 can be seen, which rapidly vaporise. However, it proves that the gas was rapidly cooled from room temperature to –78oC! (ii) When you rapidly pump air into a bicycle tyre the gas warms up because the molecules are forced closer together so the intermolecular forces can operate more strongly, this, just like bond formation, is always an exothermic process. Therefore generally speaking for any gas the lower its pressure and the higher its temperature, the more closely it will be 'ideal', i.e. closely obey the ideal gas equation PV=nRT etc. Also the smaller the molecular mass or the weaker the intermolecular forces, the gas will be closer to ideal behaviour. However, for any gas at a particular P and T, its all a question of what factor outweighs the others. Note that both positive and negative deviation from ideal gas behaviour can occur and there will be situations where the different causes of non–ideal behaviour cancel each other out. Check out the graphs at the start of 5a. and 5c. The measurement and predictions of gas behaviour is very important in industrial processes and so many mathematical developments have been devised to accurately describe the real behaviour of gases. The Van der Waals equation is one of the earliest and simplest equations to model real gas behaviour. Equations such as the Van der Waals equation for real non–ideal gases attempt to take into account the volume occupied by the molecules and the intermolecular forces between them. The idea is to incorporate 'corrective' terms to reproduce or model real gas P–V–T behaviour with a modified equation of state. a and b are the Van der Waal equation constants. The factor n2/V2 is related to the gas density, the more dense the gas (i.e. moles/volume), at higher pressures, the more intense will be the intermolecular attractive force field effects. A selection of a and b Van der Waal's constants are given below. The constant a varies considerably from gas to gas because of the wide variety of intermolecular forces e.g. very low for helium and non–polar hydrogen (2 e's each, just instantaneous dipole–induced dipole forces), to much higher a values for larger polar molecules like water or dichlorodifluoromethane (more electrons and extra permanent dipole–permanent dipole intermolecular forces). The constant b varies less, and not unexpectedly, just tends to rise with increase in molecule size. Critical values of gas behaviour. This is the maximum temperature at which a substance can exist as a liquid. Above Tc, only the gaseous state can exist, however great the density or pressure! It might be truer to say that above Tc, the gaseous and liquid state become indistinguishable as the meniscus just disappears! This is the pressure the gas exerts at the critical temperature. Generally speaking the critical values for a gas/liquid increase with increase in intermolecular forces e.g. due to increase in molecular mass or increasing polarity of molecule. The compressibility factor z, is defined as the ratio PV/nRT. Since PV = nRT for an ideal gas, then z = 1 for an ideal gas. z varies with pressure or temperature for any gas, see the PV versus P graph in section 5a. which gives an indication of how z might vary with pressure at a given temperature). Clearly from the graph on the right for methane, z can be at least as high as 2, and, at least as low as 0.6, showing considerable deviation from ideal gas behaviour, particularly at low temperatures (influence of intermolecular forces stronger) and high pressures (where the effect of both actual molecule volume and intermolecular forces are important). See more detailed discussion in 5a. As the pressure becomes lower and/or temperature higher, the gas becomes more ideal in terms of its physical behaviour and particularly 'ideal' as the pressure tends towards zero. Known values of z can be used to calculate the real P–V values for a non–ideal gas. Question! If you increase the pressure of a gas it can change into a liquid. But, increasing the pressure, also increases the temperature, so shouldn't the gas remain a gas? Gases can be converted to liquids by compressing the gas at a suitable temperature and this is done commercially at as lower temperature as possible e.g. liquefaction of air to fractionally distil off nitrogen and oxygen or liquefying petroleum gas. 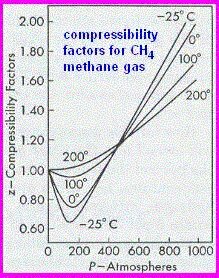 Gases become more difficult to liquefy as the temperature increases because the kinetic energies of the particles that make up the gas also increase and the intermolecular forces have less influence i.e. more easily overcome. When you increase the pressure of a gas you force the molecules closer together and if the extra intermolecular force is strong enough liquefaction occurs. Remember the force of electrical attraction is proportional to the numerical +ve charge multiplied by the –ve charge divided by the distance squared. However when you compress a gas it can heat up. This is because heat is generated by the increased intermolecular interaction (remember bond formation is also exothermic) but here its just weak molecule association due to the intermolecular attractive forces. BUT liquefaction = condensation and is an exothermic process, so heat must be removed to effect the state change of gas ==> liquid. If the temperature is low enough and the heat is dispersed liquefaction can still happen. If it is too hot it would stay as a gas. So liquefaction conditions are all about temperature, pressure and heat transfer i.e. the ambient conditions. However, above a certain temperature called the critical temperature (Tc) you cannot get a liquid with a 'surface', what you get is an extremely dense gas that is close to being a liquid but not quite! The critical pressure (Pc) of a substance is the minimum pressure required to liquefy a gas at its critical temperature i.e. the critical pressure is the vapor pressure at the critical temperature. The vapor–liquid critical point denotes the conditions above which distinct liquid and gas phases do not exist and a meniscus no longer exists! The point at the critical temperature and critical pressure is called the critical point of the substance.